Last year while Luis was away on his family trip I got to check out The Spotted Pig for Bradley’s birthday dinner with the crew. It was definitely worth the wait, the 2-hour wait haha. We stopped by a local bar, and the weather was really great so it was ok. I ended up taking Luis here for his birthday later in the year because I really wanted him to have it too! James Beard award obvi well deserved. April Bloomfield FTW. The Spotted Pig is known for updating their menu items seasonally, but they also have some items that are standard on their menu. They call it British Italian. 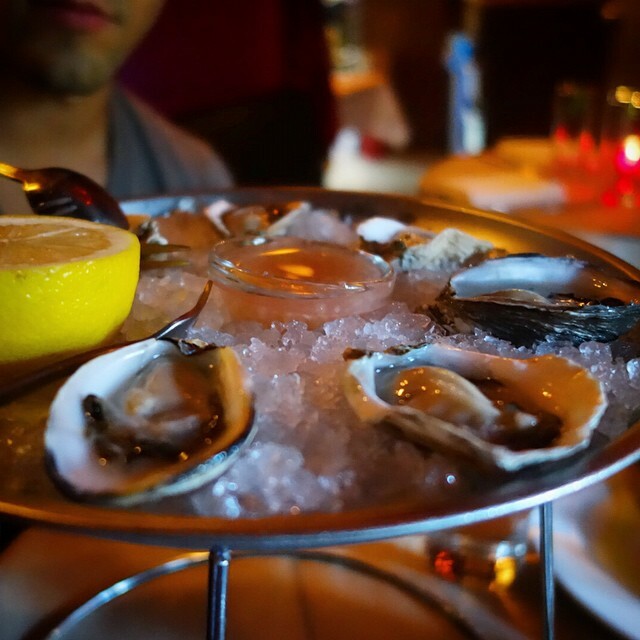 I will go there again and again for the liver toast and raw oysters with mignonette alone. I didn’t know what mignonette was, but now I do, and it is delicious! It is basically a sauce made of shallots and vinegar that you top oysters with. 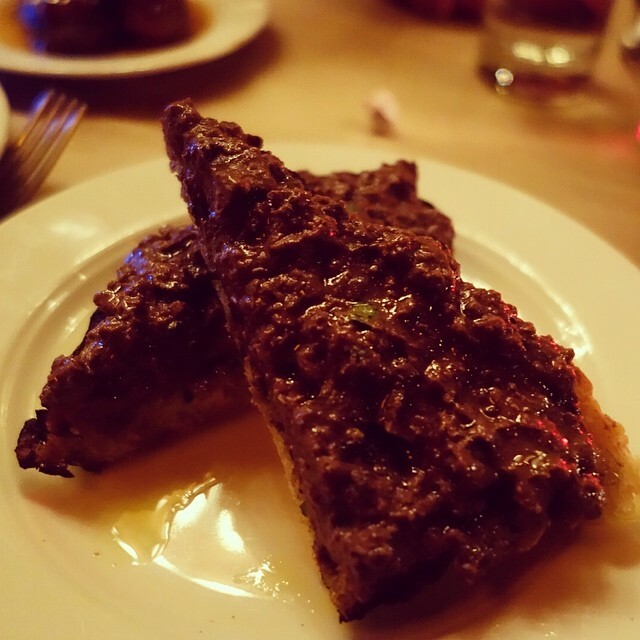 The liver toast is to DIE for. I had a great cocktail here called the Harlow. It is no longer on the menu, but if you like semi-girly drinks like I do I definitely recommend it. It was created by one of the bartenders there, so even if you don’t see it on the menu they can surely whip it up. It is made with aperol, st germain, dibon cava, lemon and soda. YUM. When we went for Brads Bday dinner ramps were in season. I had never actually even heard of ramps at that time! But my first experience with them was amazing. 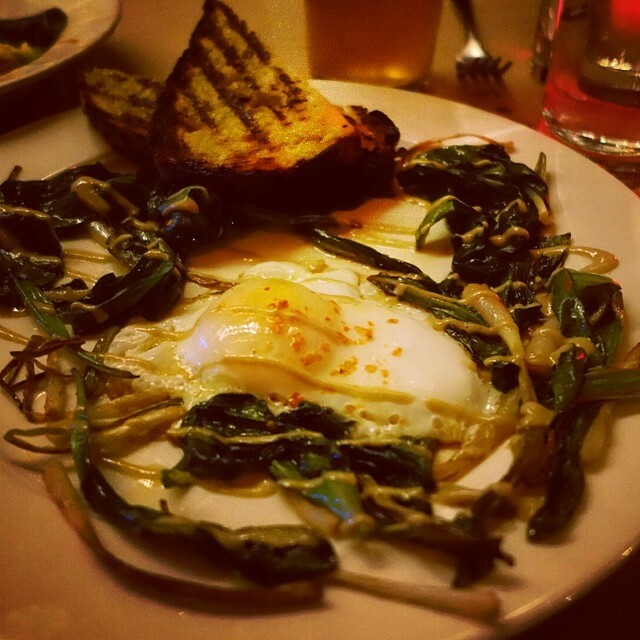 The ramps were served with a runny yolk duck egg, anchovy vinaigrette and bacon. Seriouslyyyyy good. 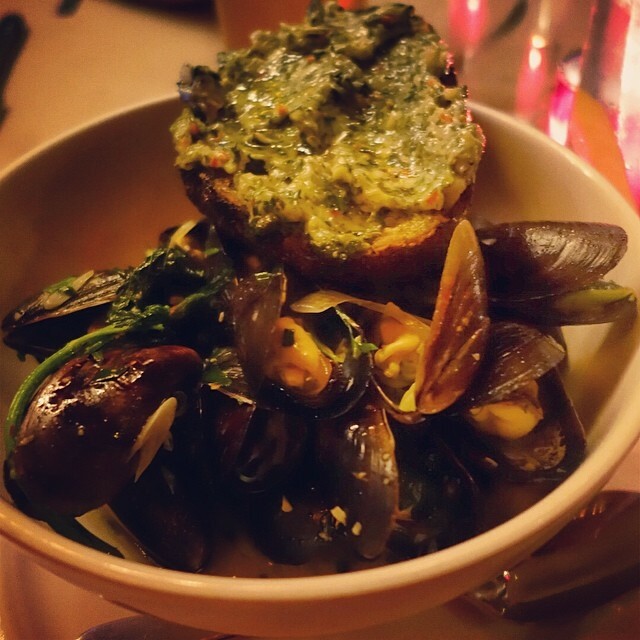 Of course for my main I got the mussels. Yum. They were served with toast spread with nettle butter. I had never heard of nettle either, but apparently it is a winter herb, even though it was spring. Recently Luis’s cousin was in town so we stopped by again and tried out the burger since they were only serving the bar menu, and we had never tried it. There was no wait so that was awesome. 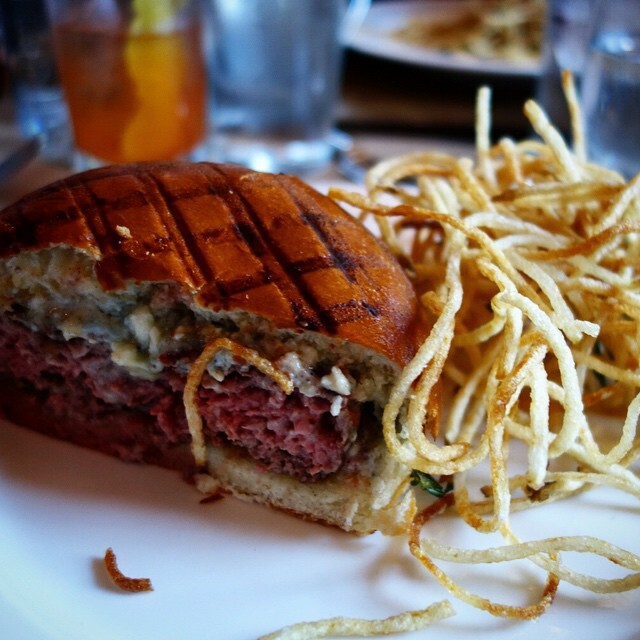 The bleu cheese on this burger is very good. The shoestring fries are super tasty, just kind of hard to eat. 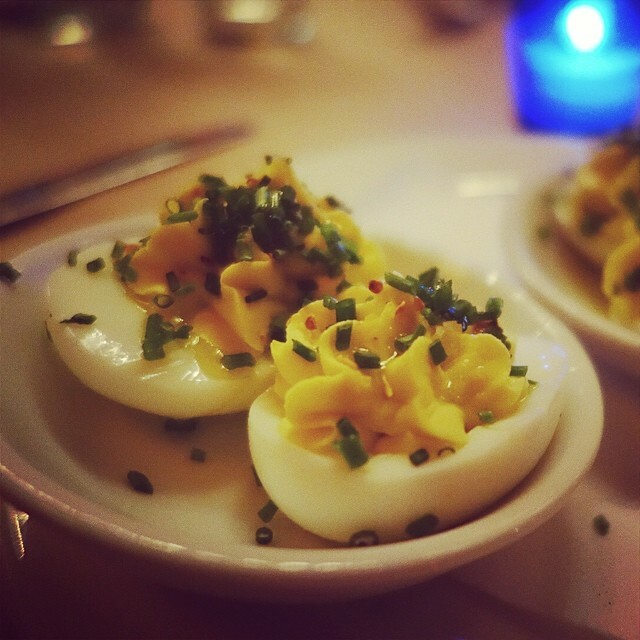 The Spotted pig is known for their devils on horseback, aka bacon wrapped dates, and their deviled eggs. 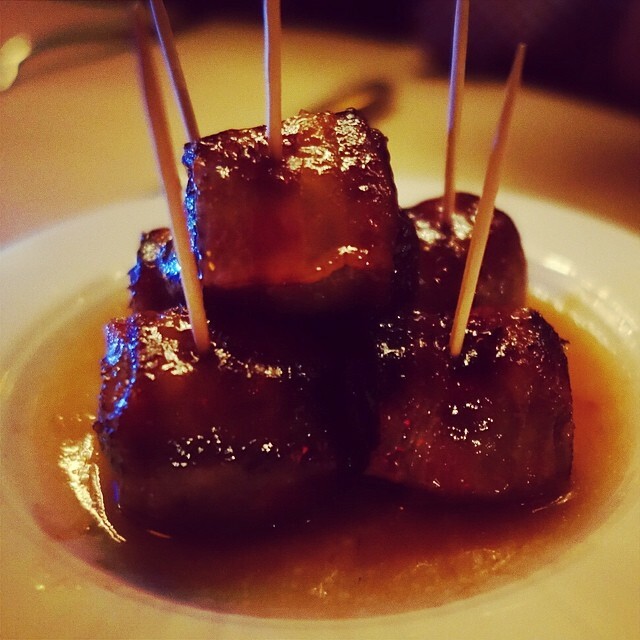 The bacon wrapped dates were good, but not any better than the ones I LOVE from Buceo 95. I’ve never made this dish so I can’t really say anything haha. But the deviled eggs were not anything special in my opinion; they taste just like how I make them. They are pretty expensive for 1 egg too! If you haven’t tried this place I really recommend you do. They do NOT take reservations, so your best bet is to get your name on the list as soon as they open. That is what we did for Luis’s birthday and we got seated almost immediately, and had a really cute, cozy corner table upstairs. The place is really a sight to see with the rustic décor and pigs everywhere. I love all of the fresh herbs and veggies they grow right out front and all along the windows all year long. 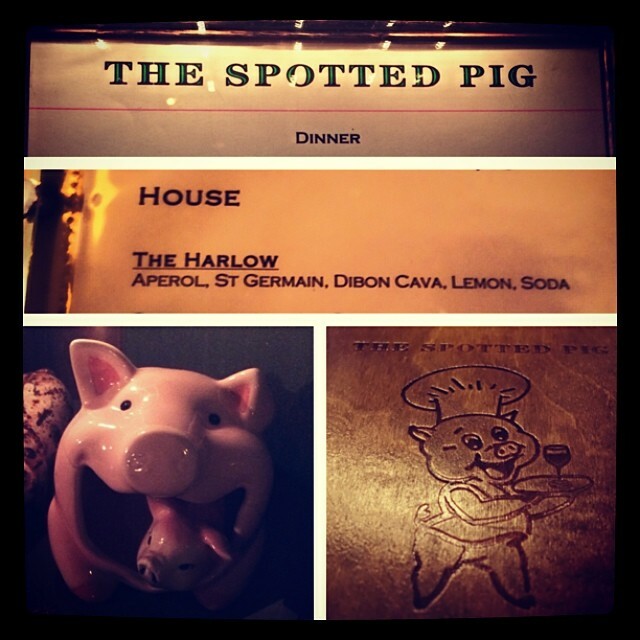 Spotted Pig is a personal fave. One of the best things they do is they never rush you out! One dinner time the tables near us turned over twice, and they still made us feel welcome.